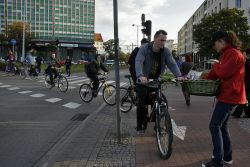 Gdansk defended its position as the bicycle friendliest city in Poland. Rating was organized for the second time by the „Rowetour”, a monthly magazine focusing on a cycling life style. In 2010, within the first rating, surveys were distributed among 16 biggest cities and 2012 already to 41 cities with population over 100 thousand. Surveys focused on cycling infrastructure, special facilities for cyclists, or ways of promoting everyday bicycle usage. “The Bicycle in the City 2012 Report” together with bicycle friendly cities rating were published in the November edition of the „Rowertour”. Cycling policy together with investments in cycling infrastructure pay off in Gdansk. Also other towns of a wider Pomeranian region were inspired by Gdansk’s example. Slupsk came second in rating, Elblag – seventh and Gdynia – eighth. As in Gdansk, Elblag has recently appointed an Active Mobility Unit. When it comes to developing standards for designing and building cycling infrastructure, a good example also comes from Gdansk, were the first document like this was developed in 1999 and has been updated since then on. Gdansk, together with Lublin is also leads in obtaining EU funds for road investments. An actual implementation of plans declared in a previous report was also checked. Since 2010 Gdansk has extended its asphalt cycling routes network by 31,5 km and its an increase by 38%. In Bialystok they came up with 23 km of cycling routes (increase by 23,5%) and in Kielce – 8 km (increase by 40,5%). The research also focused on designated cycling contra lanes. It revealed that contra lanes are present in 18 out of 41 surveyed cities. Unquestionable leader is Gdansk, allowing to ride a bike in opposite direction on 56 streets (total of 12 km). Gdansk is followed by Wroclaw and Cracow which have about 2 km of such routes, each. The „Rowertour” was also interested in traffic calming zones, and again Gdansk is a leader. Many cities don’t have such zones at all or don’t keep a record of those. Another example of an innovative approach is making bus lanes available for cyclists – allowed in Gdansk and Wroclaw. Many cities don’t have bus lanes at all. A surprising outcome of the first report in 2010 was a lack of a person or a unit responsible for cycling policy in many cities. Two and a half years later the situation has improved - a half of surveyed towns has designated a person or a team to coordinate cycling matters. The Rowertour is a national monthly magazine focusing on cycling tourism and life style. It has been present since 2008. You can find the article about the rating in Polish language here.